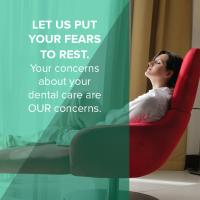 Shoreline Dental Patients, Let Us Help Your Dental Anxiety! Shoreline Dental Patients: Let Us Alleviate Your Anxiety About Visiting the Dentist! As you know, regular visits with Dr. Co and the Shoreline Dental team are vital to keeping your teeth and gums healthy and to help protect your whole-body health. It’s our top priority to make your visits as comfortable as possible. We’re sensitive to your fears, concerns, and circumstances! We will not rush you into a decision: If a specific treatment is needed or recommended, Dr. Co will discuss all your options so you can make an educated choice. No surprises: If you’re anxious about costs of necessary dental treatments, be assured that we will go out of our way to fully educate you about the costs upfront, so there are no surprises later on. Our treatment coordinators, Jennifer or Linda, will explain financing options as well as what may or may not be covered by your dental insurance. We make it our aim to put you at ease throughout your entire experience with Shoreline Dental. If you’re nervous about visiting the dentist, please call us at 206.440.0065 and tell us your concerns. We’re happy to answer any questions you have and we hope to relieve your anxiety!